The Society of Nigerian Artists Lagos cordially invites you to its 11th annual juried art exhibition, October Rain 2009. The exhibition will open on Saturday 17th October 2009 at 4.00 pm at the National Museum, Onikan, Lagos, and continues until Thursday 22nd October 2009. A social development and gender specialist for the DFID-funded Education Support Sector in Nigeria programme. The position is based in Abuja and is for 18 months initially. This opportunity will suit someone with at least five years' field experience. See the AWID website for more information. Apply for the Systers' Pass it On grant to support programmes that encourage women in computing. The Systers is an initiative of the Anita Borg Institute for Women & Technology and is a fantastic online resource, which provides a support and resource network for technical women. My favourite type of shopping is the incidental kind, when you're just browsing and then you stumble across gems that you had not previously known that you wanted, but now that you, are extremely excited to own. This happened to me today when I went to Borders to browse the books. 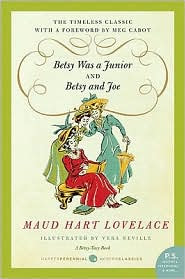 The first interesting book I happened upon was Betsy Was a Junior/Betsy and Joe by Maud Hart Lovelace. This series appears to be the early 1900s' version of the Sweet Valley High books that I used to read, following the heroine Betsy as she grows up. After speaking with a shop assistant, who it turned out was reading one of the books, I also got Betsy and the Great World/Betsy's Wedding. Betsy's Wedding: When Betsy's boat docks in New York, Joe is waiting there . . . with a ring! But she's going to learn that marriage isn't all candlelight, roses, and kisses. There's also cooking, ironing, cleaning, and budgeting— and will she be able to find time to forge a writing career? Then, I found Not That Kind of Girl by Carlene Bauer about a woman questioning the values that she was brought-up with. The last discovery was Marrying Anita by Anita Jain about an Indian-American woman's search for a husband, which leads her to India. Corrine Bailey Rae is back with a new album after the tragic death of her husband Stephen Rae last year of an accidental overdose of methadone and alcohol. I was at the Grace Hopper Celebration of Women in Computing in Tucson, Arizona and it was a wonderful event. It was great to be surrounded by so many techie women. The Grace Hopper Celebration of Women in Computing is a series of conferences designed to bring the research and career interests of women in computing to the forefront. I was awarded the Change Agent Award along with 2 other African women (1 from Nigeria and 1 from Kenya). I have to say that I haven't enjoyed a conference as much as this one in a long time. I was re-energised and 're-inspired' for my work. Review notes from the conference on the GHC blog and the Twitter updates.